...pounding head, aching body, dry mouth full of thirst, dizziness, nausea, spinning room. You feel like you were beaten up with a hammer and swear you’ll never do that again. Many people liken it to feeling like the flu or even better yet, like they were poisoned. Remarkably, little is known about the physiology underlying the hangover condition. Scientists aren't clear whether hangover signs and symptoms are attributable to alcohol’s direct effects on the body, its aftereffects, or a combination of both. So let’s present the facts of what we do know. Without getting too technical, here's how alcohol dehydrates you: alcohol inhibits the hormone that makes you not pee (vasopressin). And so this extra urine production sends the water right to your bladder thus preventing your kidneys from reabsorbing that water. Bad news for vital kidney health. That frequent urination also expels salts and potassium that are necessary for proper nerve and muscle function, thus imbalancing your electrolytes. These sort of complications can contribute directly to cardiac arrest. There are a number of more serious reactions like stupor, respiratory failure, hypotension or cardiac arrest. Oh, and while we're in the thick weeds of truth here, understand that death may occur from respiratory or circulatory failure or from aspiration of gastric contents. Cardiac arrhythmias – that's a problem with the rate or rhythm of the heartbeat – are another potentially fatal complication of an alcohol binge. 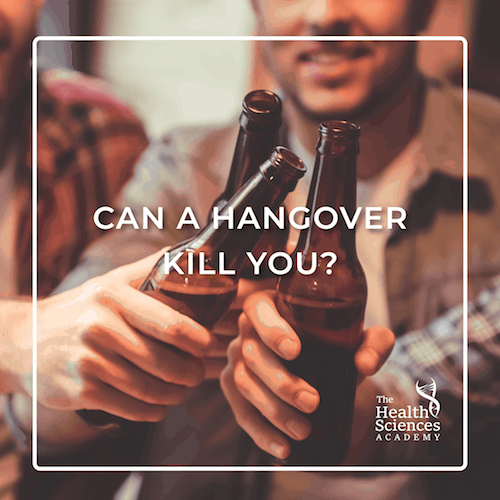 So, depending on your body's ability to handle, process and clear the alcohol in your system, you could be looking at some serious issues – especially if you've drank enough to experience a significant hangover. "It happened to me once, a long time ago. I was out with a friend. Only later I realised that I suffered from alcohol poisoning with a 'hangover' that lasted for three whole nights and days. I thought I was going to die. Never again, I said!" On the other hand, what about drinking to that level just above the guidelines, but not on a regular basis? Known as binge drinking, it's quaffing a large amount of alcohol over a relatively short period of time. And it has some serious hazards itself. Did you know that alcohol causes 3% of cancers in the UK every year? That's around 11, 900 new cases a year, according to Cancer Research UK. Even moderate drinking leads to short-term impairment and lack of control, as shown by extensive research on the impact of drinking on driving. It's a depressant and it can be deadly. But rather than die directly from a hangover, what will ransack you is the poisoning, dehydration and/or severe CNS (central nervous system) depression of over consumption. You're more informed now, so make sure to drink in moderation and if you choose to drink, do it responsibly. How about you? Do you have a shareable drinking-story-lesson that comes to mind? Did it help you shed some light or did it downright slap you in the face on the reality of alcohol over-consumption?